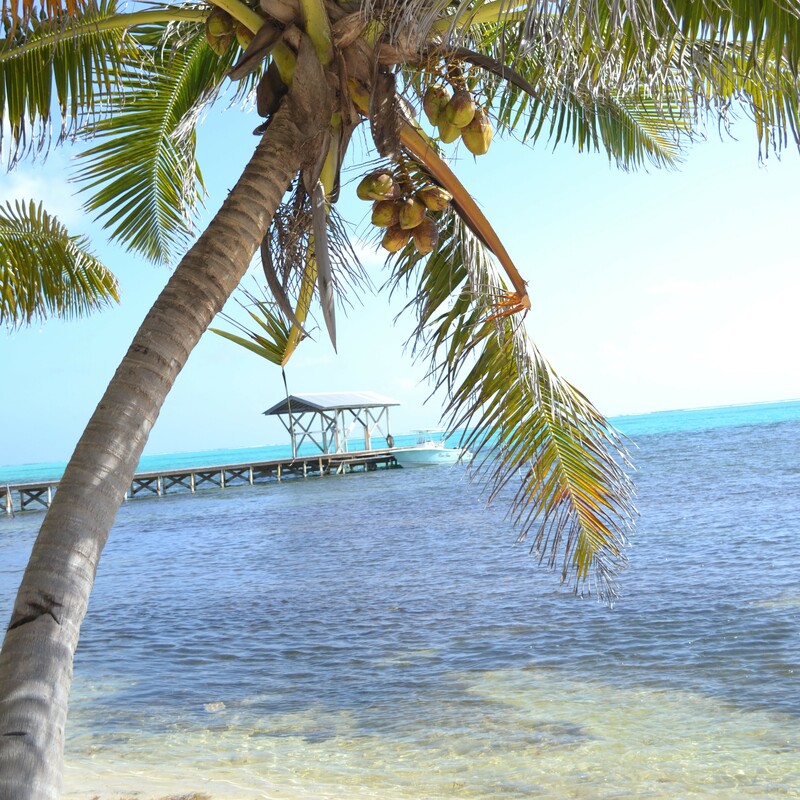 Belize is a beautiful country and the people there are just as equally beautiful both inside and out. 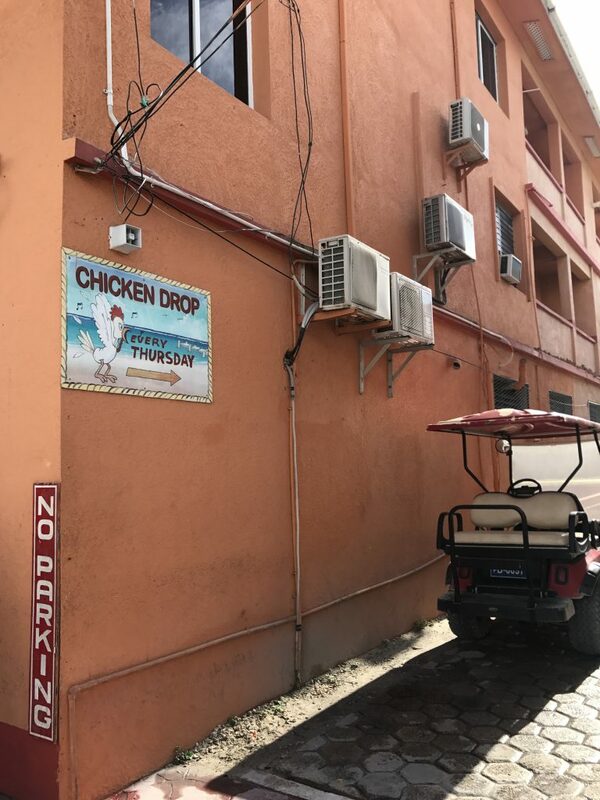 While doing my research on the country and the must-dos, it was made clear how wonderful and helpful both the natives and the out of towners that never left are (yes, this is a common occurrence in Belize and I completely understand why). 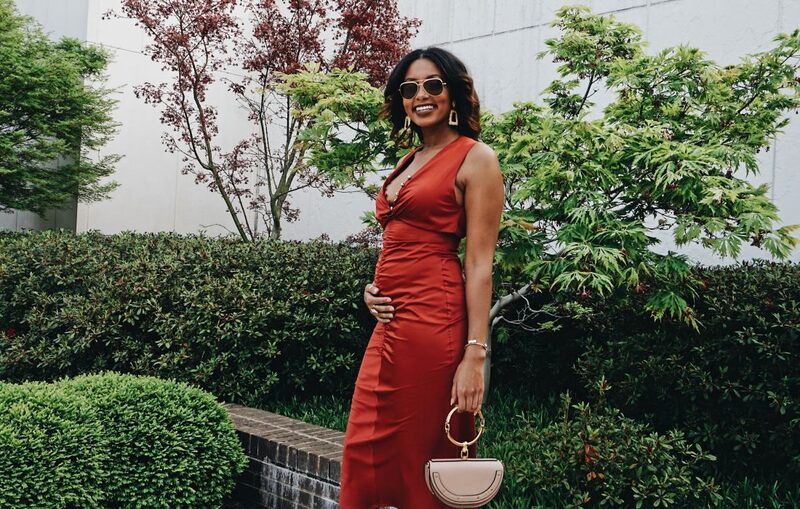 We were so happy our experience with everyone we met exceeded our expectations and we are so thankful to everyone who contributed to our list of places to see, things to do and restaurants to eat at. Initially, I assumed the prices were discounted because it was Belize’s offseason, however, it is actually the complete opposite. November through April is the country’s peak season for tourism. I was excited to learn this because it also means excursions and travel options are not limited to the number of people who sign up. 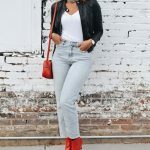 Enjoy the guide and be sure to leave a comment or ask your questions in the comment section below or on my Insta! Although we did not have a direct flight to Belize, it wasn’t bad. 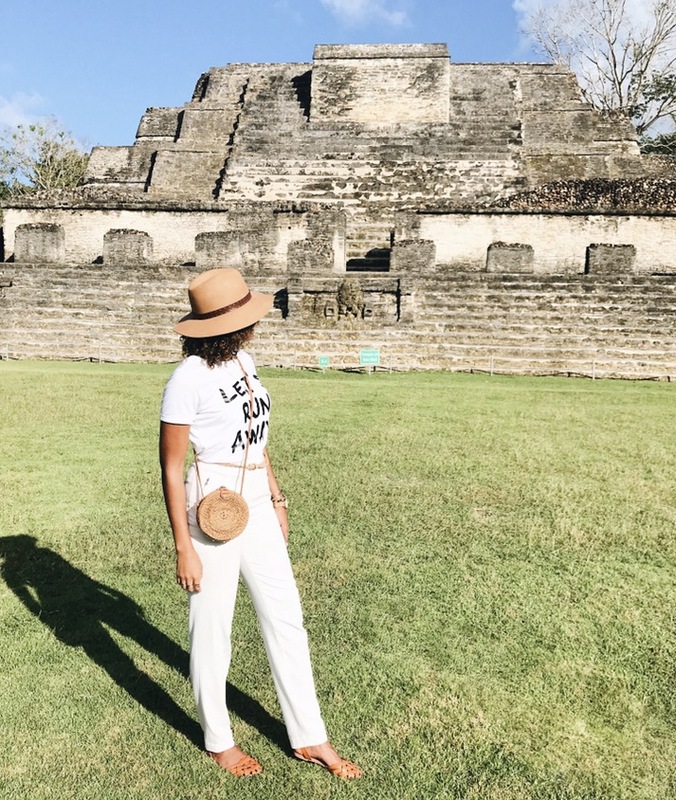 We flew through American Airlines from O’Hare Airport in Chicago to Miami with a 2-hour layover and then flew into Belize International Airport in Belize City. While our flight to Miami was full, our flight to Belize was only 40% full so we had an entire row to ourselves and were extremely comfortable. Because we had a layover, I was too nervous to check my bag and stuck to a carry-on. Our flight didn’t have any issues but our suitemates told us about their baggage being lost for 2 days of their trip and I am not about that life — especially with my natural curls. Nope. lol! 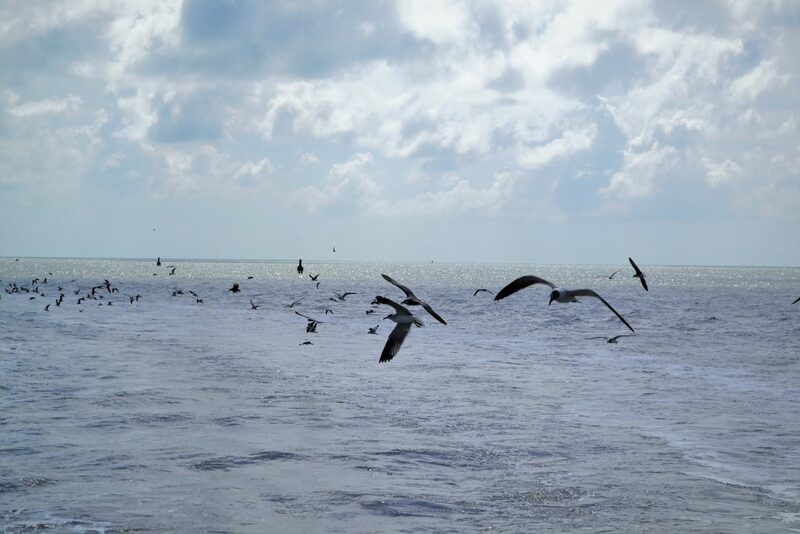 A short flight over the water and into San Pedro will offer a very scenic route to the island. 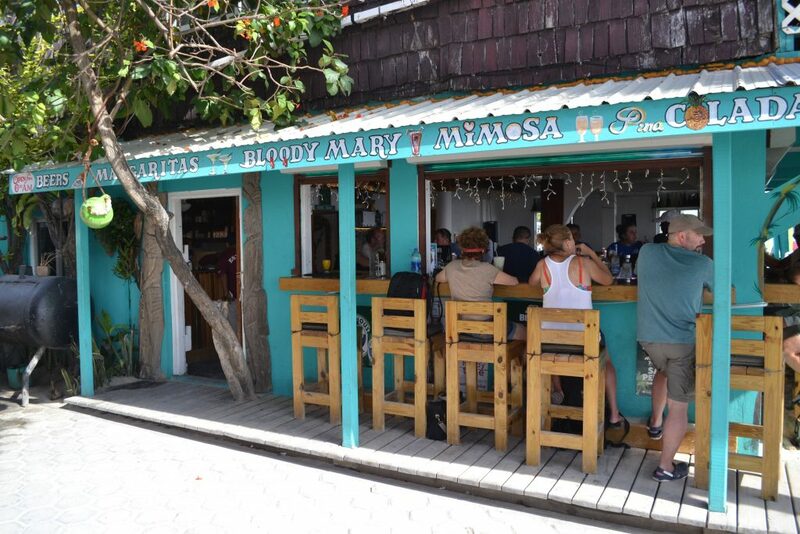 During the day, you’ll get great views of the islands and the Great Blue Hole so have your camera on standby! You have the option to fly out of the Belize International Airport (BZE) which is convenient since you won’t have to leave the airport. Once you exit immigration, you’ll pick up your checked bags (if any) and head straight to the departure area to head to San Pedro. Currently, the rate is $125 per person, plus fees – this includes adult and children. Please note, as fuel charges increase, this rate will most likely change as well. The other option is to fly out of the Belize City Municipal Airstrip (TZA) which uses local airlines Maya Island Air and Tropic Air. While it does require about a 20-minute drive from BZE once you’ve gone through customs, the main advantage to flying out of TZA is the cost savings. Maya Air offers bargain hopper tickets at $72, Economy Promotional at $83 and Economy Unrestricted at $104.50 plus tax. Infants only pay tax (with the Maya Bargain Hopper, taxes are $6.50). With Tropic Air, adult and children tickets are $86 (plus $3.75 fees) and infants are only charged $3 for taxes. Again, as fuel charges increase, this rate will most likely change as well. 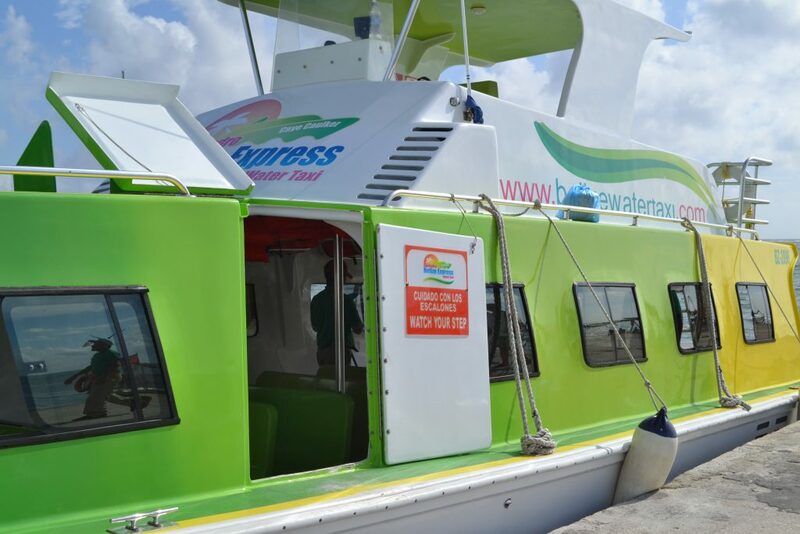 While the boat ride takes 1 ½ hours, it is much more budget friendly. We paid $38.00 for our round trip tickets which can either be purchased online in advance or at the window at the dock. Please note, the tickets are not reservations for a specific time so if you miss the boat you intended on making or if it gets full, you’ll have to wait for the next boat. 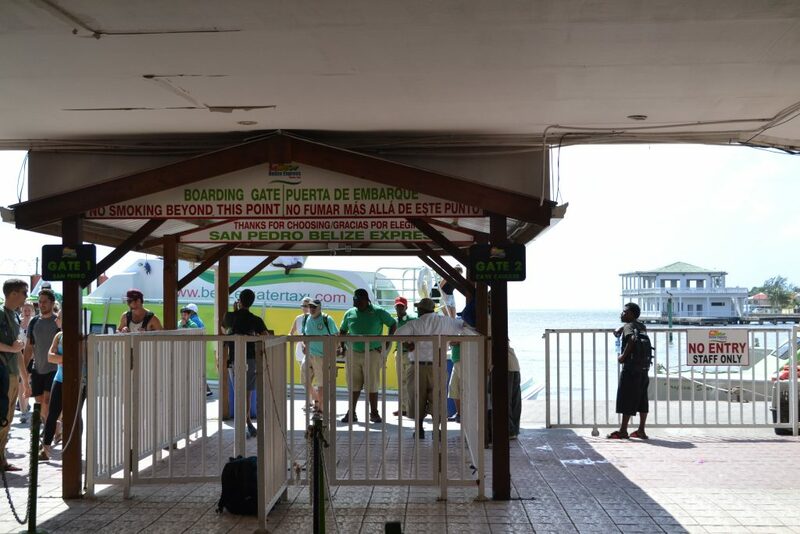 You’ll get dropped off at the dock entrance and will be greeted by employees that will ask for your bags and provide a baggage claim ticket in return.We began boarding the 5:30 pm boat at 5:15 and departed right on time. This boat can hold a good amount of people but plan on getting to the dock at least 30 minutes before departure to get in line and get a good seat up top. It can get crowded and you don’t get much outside air circulation if you are sitting on the lower enclosed end so it can get a bit stuffy. Also note, these boats do not run 24 hours so be sure to plan accordingly. 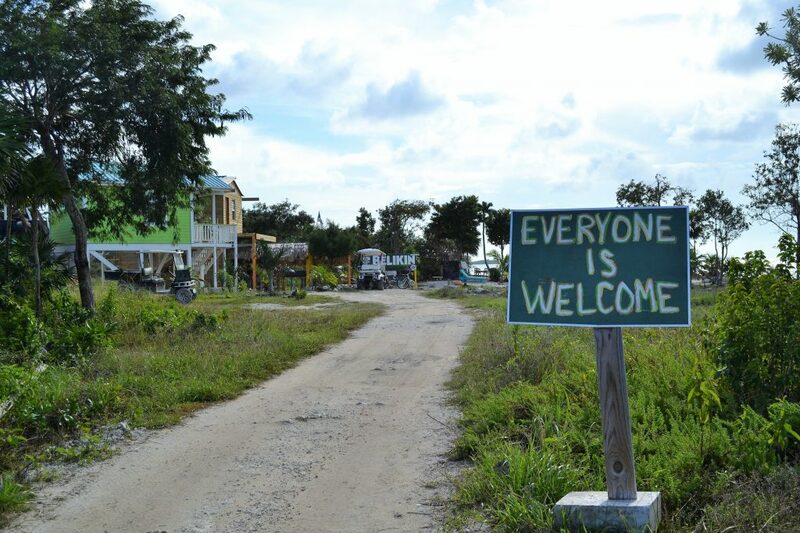 First, we stopped at Caye Caulker, which is a very lively and fun sister island, and then made our way to SPT. 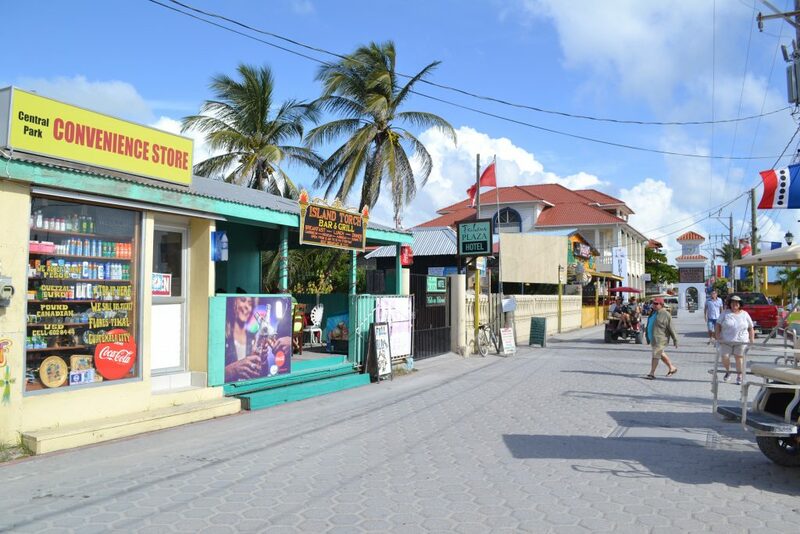 It is the same trip on your return, stopping at Caye Caulker and then heading to the mainland. 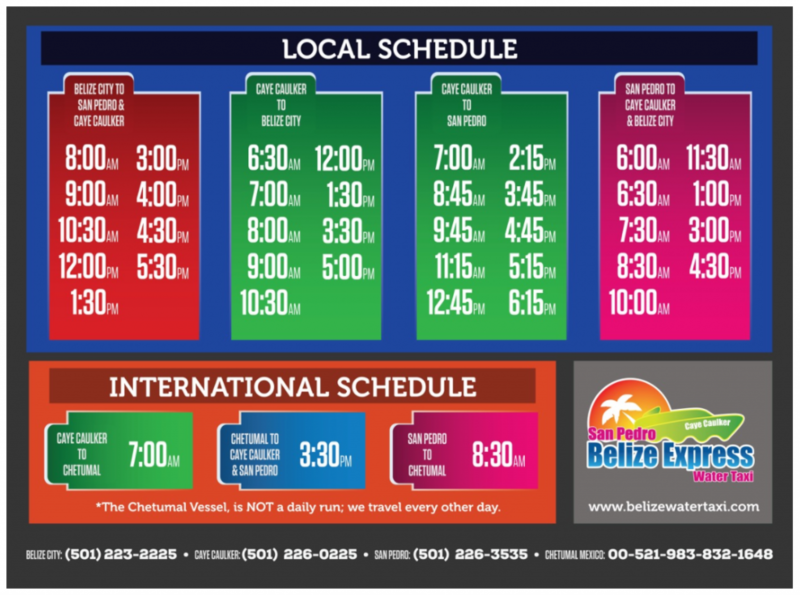 Below is the Belize Water Taxi schedule. 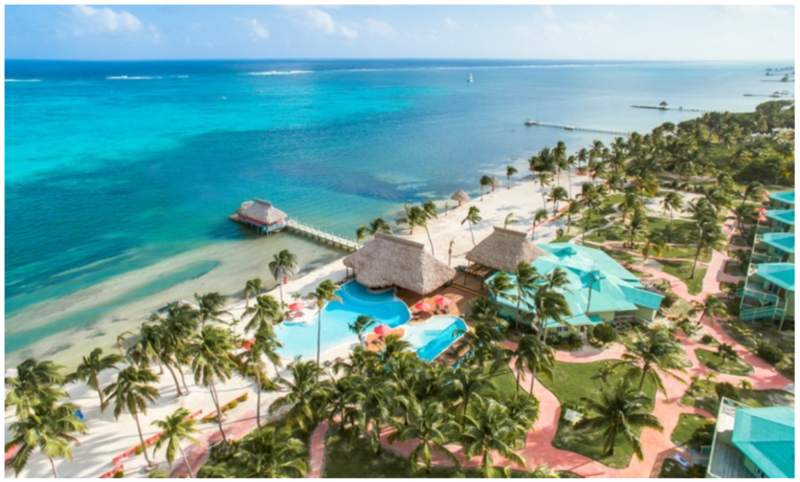 As the deal finders we are, my husband and I took our time in researching and selecting our accommodations for Belize. 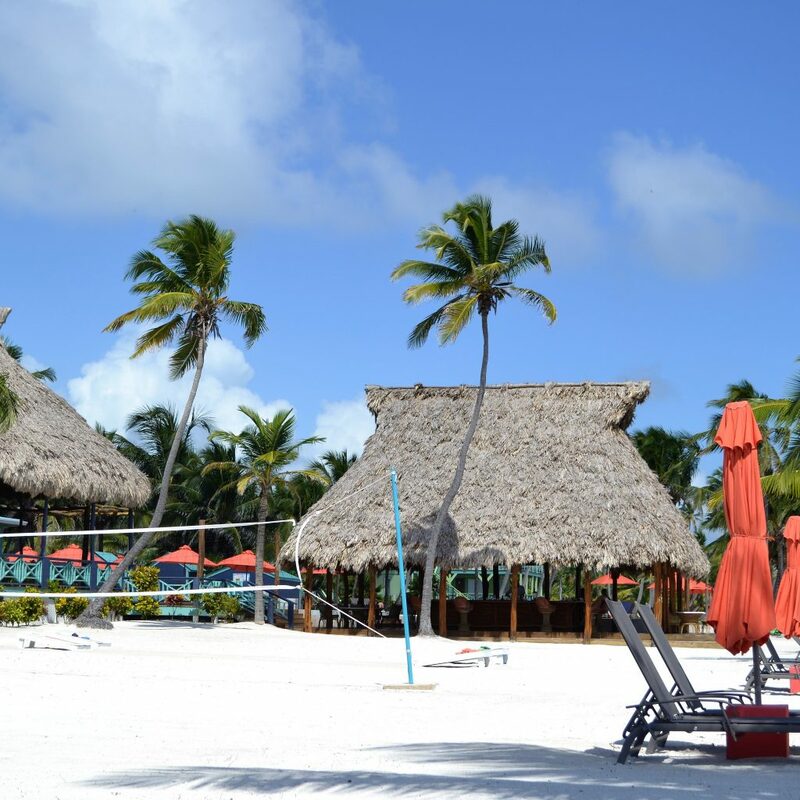 About 3 weeks before we were set to depart, we came across a hotel deal for 3 nights at Costa Blu which is located on the north end of Ambergris Caye and was perfect for our quick getaway. The Groupon deal is no longer available, but I always recommend checking out their deals. 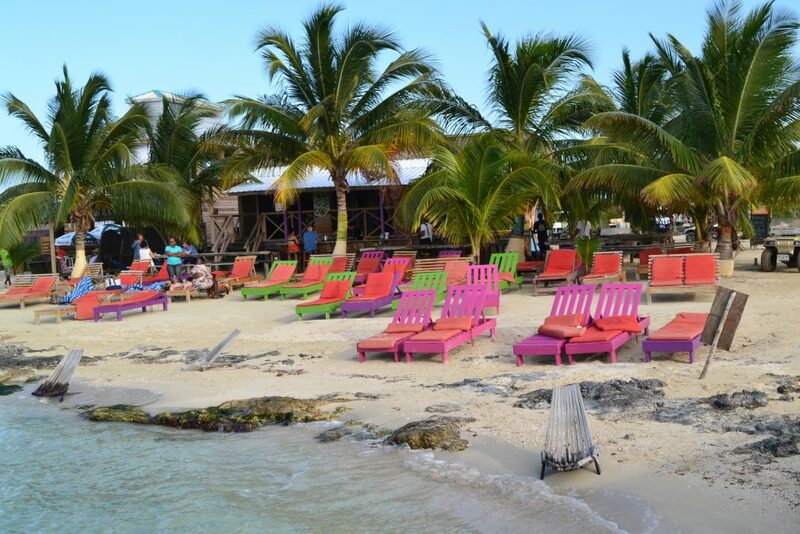 Costa Blu is an adults-only beachfront resort that is managed by Sandy Point Resorts. 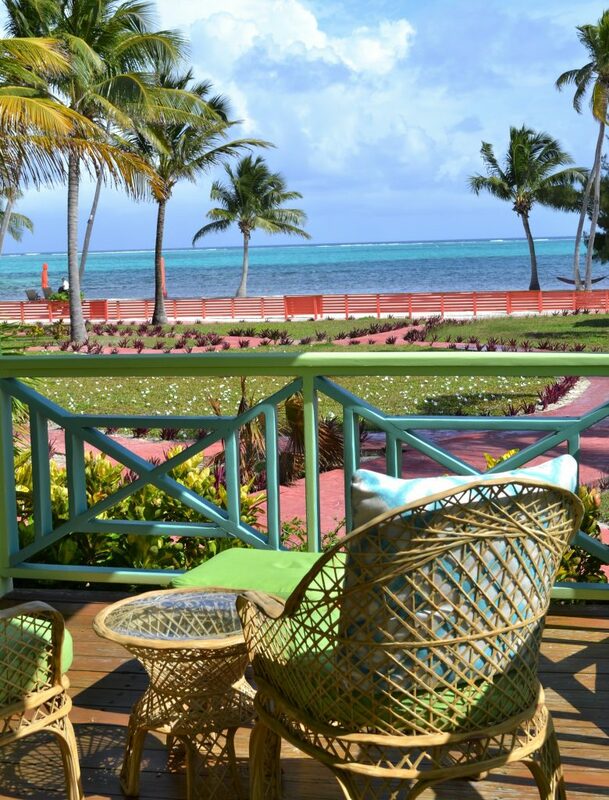 It is located about 6.5 miles north of San Pedro Town (SPT) and offers a private and peaceful experience with only 38 one-bedroom sea view suites. While it takes some time to get to Costa Blu, we had great views the entire way. 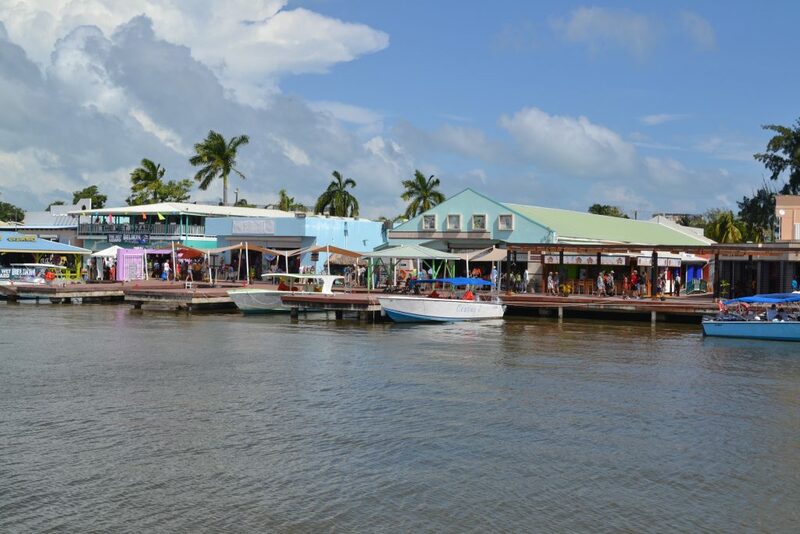 When we arrived at SPT via the Belize Water Taxi, we were greeted by a resort staff member who got us settled in another boat to bring us directly to Costa Blu. The ride was truly amazing. It was around 7pm and so dark — we were literally engulfed in the magic of Mother Nature. Hearing the sounds of the water as we cut through waves and looking up only to realize this is the best view of the stars I have ever seen was truly amazing. The ride was quiet and I couldn’t take my eyes off the sky. 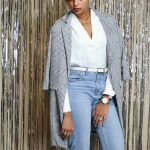 I felt so small yet so blessed to experience this greatness – it was surreal! 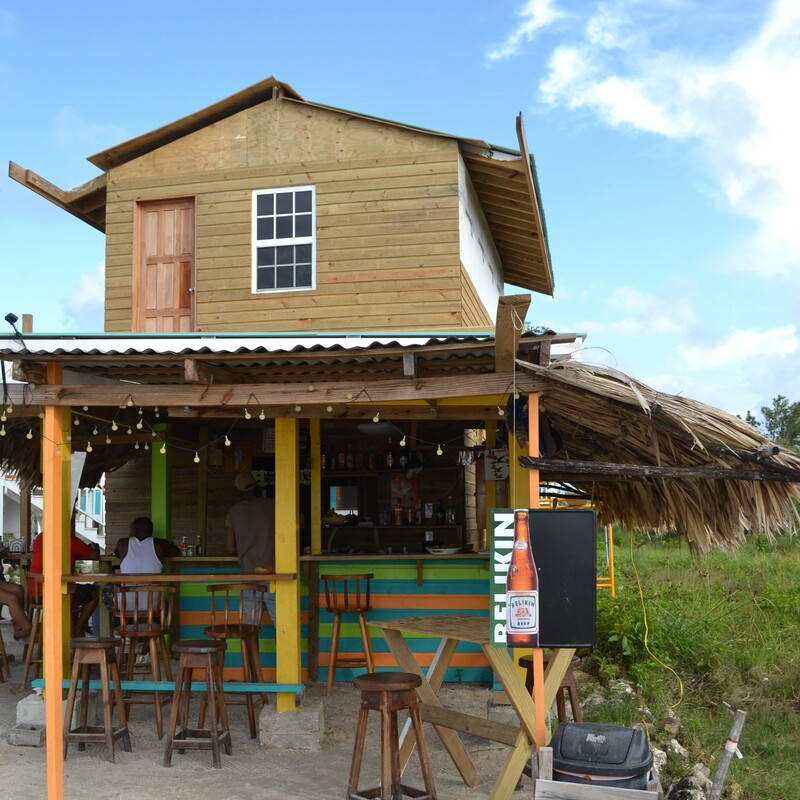 When we got to the resort dock we were welcomed with friendly faces and two shots of Belizean rum! After a tour of the common areas, we were brought to our room which was perfect. We had a living space, mini kitchen and a large dispenser of filtered water. I thought this was extremely considerate of them and something that is often not provided by other resorts. Yes, all-inclusive resorts offer water but you have to go to the bar to request it which is obviously not conveniently located in your room. However, Costa Blu is not an all-inclusive and this simple amenity was extremely considerate and I am so thankful for it — it’s the little things! 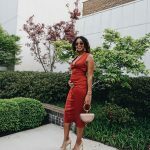 As we walked into our bedroom, they decorated the bed with fresh petals and a complimentary bottle of Chardonnay which was an extra special treat! Our room faced the ocean so we enjoyed a scenic breathtaking view right from our balcony or a short walk to a couple of hammocks. Sitting outside and appreciating the sounds of the waves crashing, the birds chirping and the trees swaying in the wind was such a fantastic way to start each day! 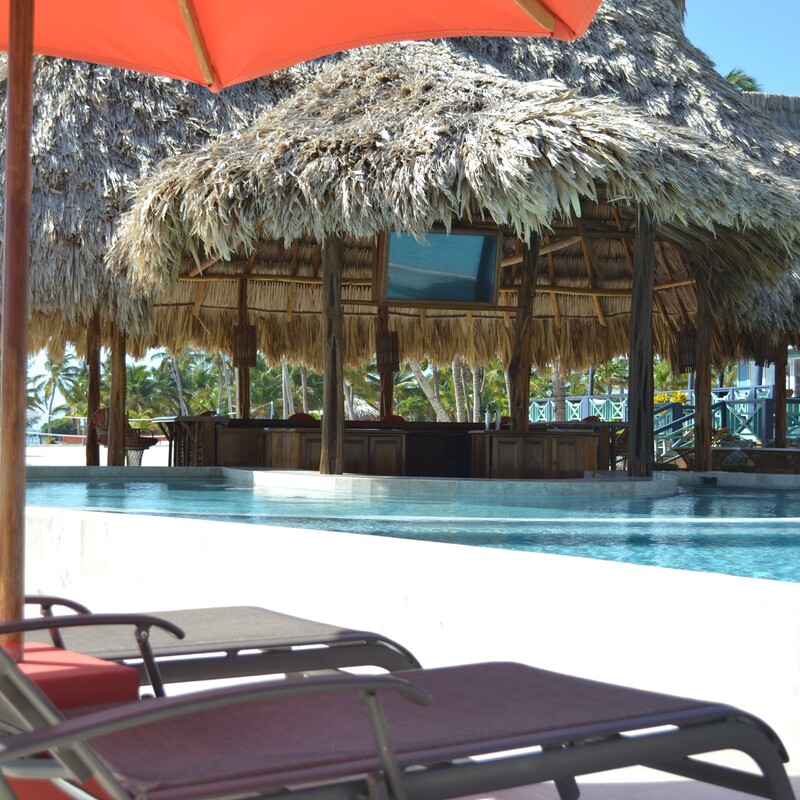 Costa Blu has a regular bar as well as a poolside bar, two pools and a restaurant that serves breakfast, lunch, and dinner. We had dinner our first night and lunch the second day at Blu Restaurant. While tasty, I do have to admit, the restaurant is a bit overpriced especially since we did our research on the price of meals and drinks. However, we do have to take into account we are paying for the convenience of an on-site restaurant. They also offered golf cart or bicycle rentals (at an additional cost) which was a perfect way to explore the island. The roads are so narrow and there is so much to explore that renting a golf cart was a priority for us. About half of the 6.5 miles to SPT are unpaved roads that made for an extremely bumpy ride but definitely worth driving through to get into town. It took us about 30 minutes each way on the cart but I’m sure if the roads were paved it would have been a shorter ride. The staff at Costa Blu were wonderful. Everyone was extremely friendly and helpful. We were so happy to have stayed here. 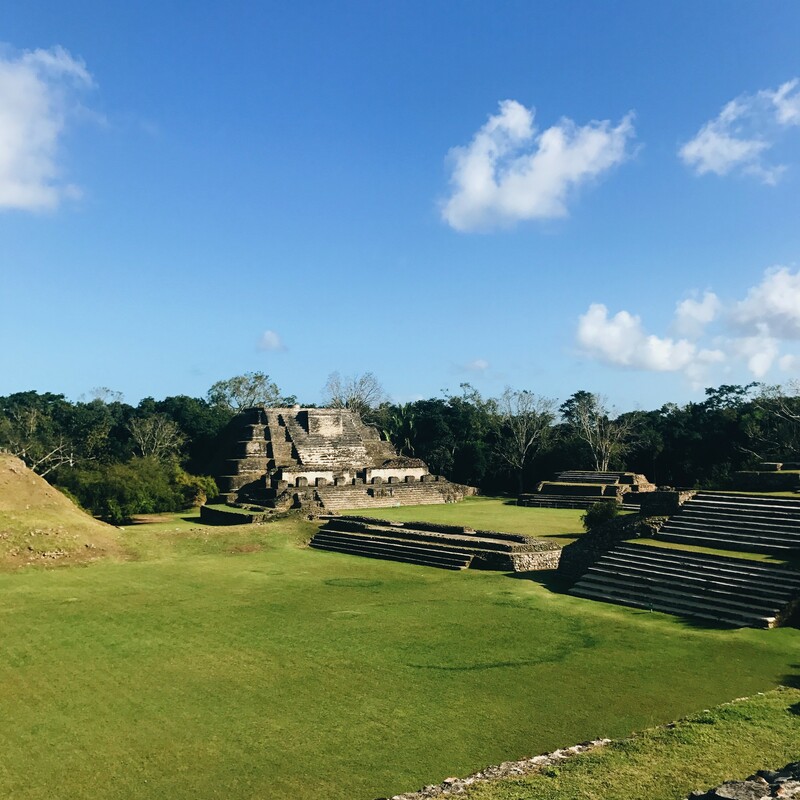 Upon our arrival at Belize International Airport, we headed straight to Altun Ha which is one of the smallest Mayan Ruins in Belize. Albeit small, it is certainly rich in history. 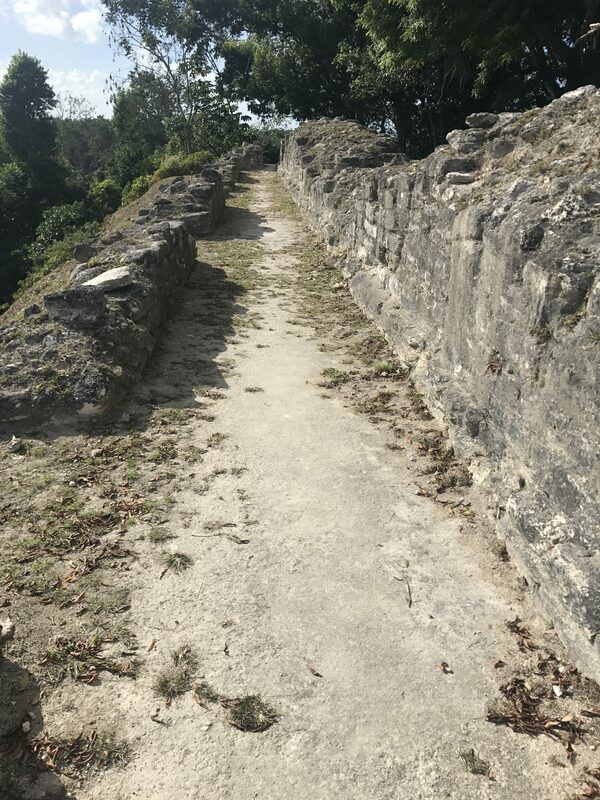 It was about a 40-minute ride from the airport and since our days were limited, it was the perfect option since the other ruins are a couple of hours away. We were greeted by Dennis of Explore Belize Caves and he was a fantastic tour guide! If we were staying longer, we would have probably booked additional tours through him. 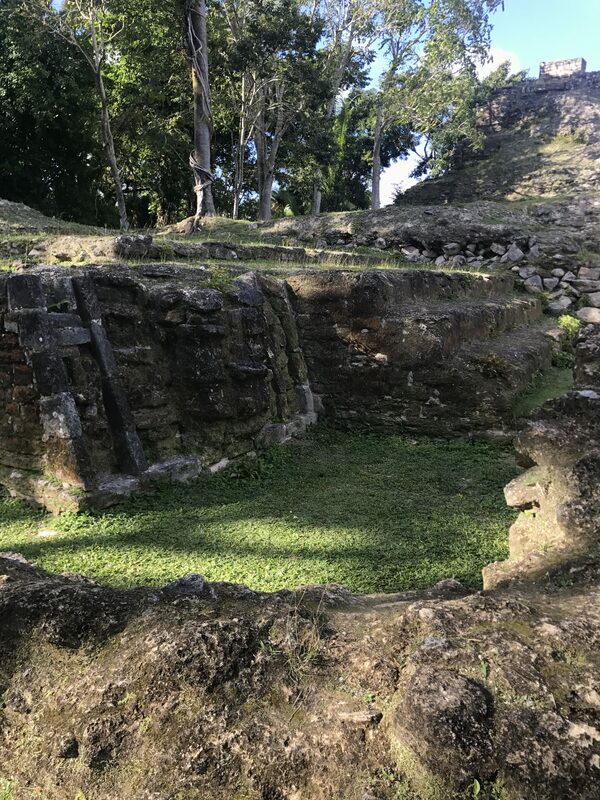 After visiting the ruin in an area known as Lucky Strike, we drove through Ladyville to get back to Belize City. The kids were getting out of school so we had a chance to see them in their school uniforms and the diversity of the country. If you have the option of driving through a new country in a group or private car and the price difference isn’t great, I definitely recommend taking on the private experience. 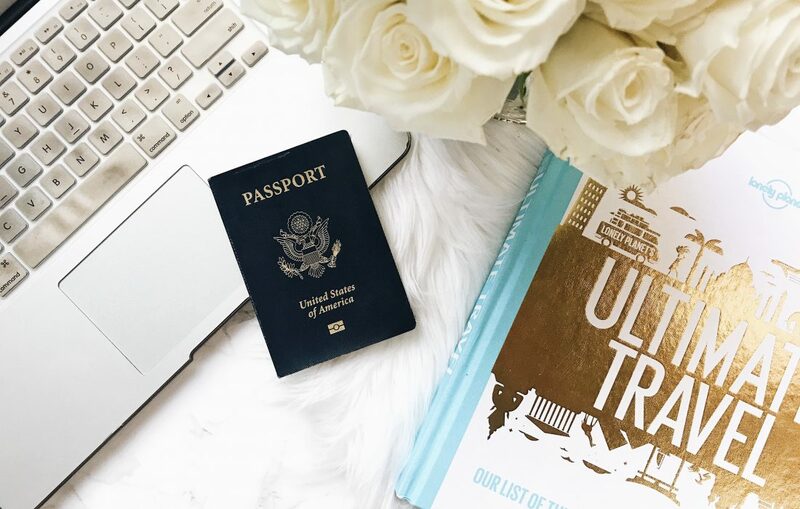 The drive is filled with so much more information about the country and the people and they are typically more than OK with making additional stops along the way. 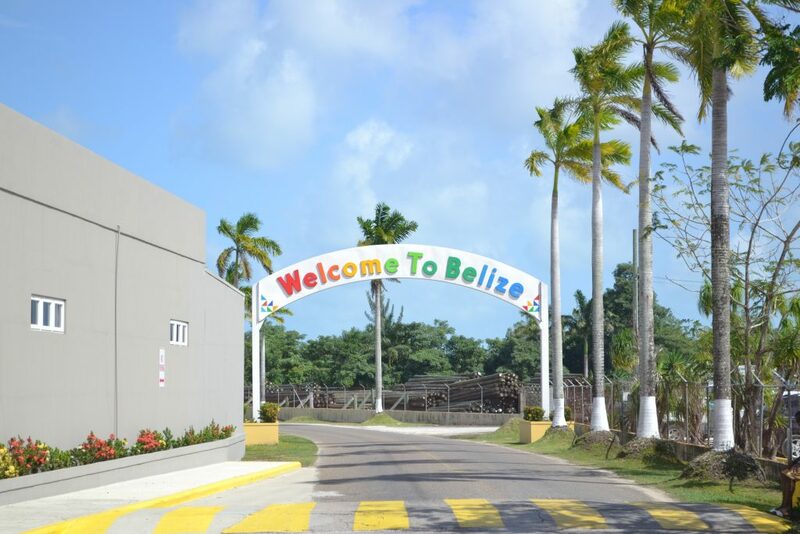 Driving through Belize City was much like driving through St. Lucia, Dominican Republic, and Costa Rica. We saw people walking alongside the roads, riding their bicycles and mopeds, and selling fresh fruit native to the county. 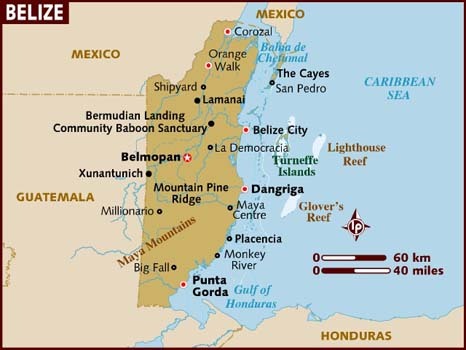 Belize’s big imports are citrus fruits which include oranges, limes, and grapefruit. 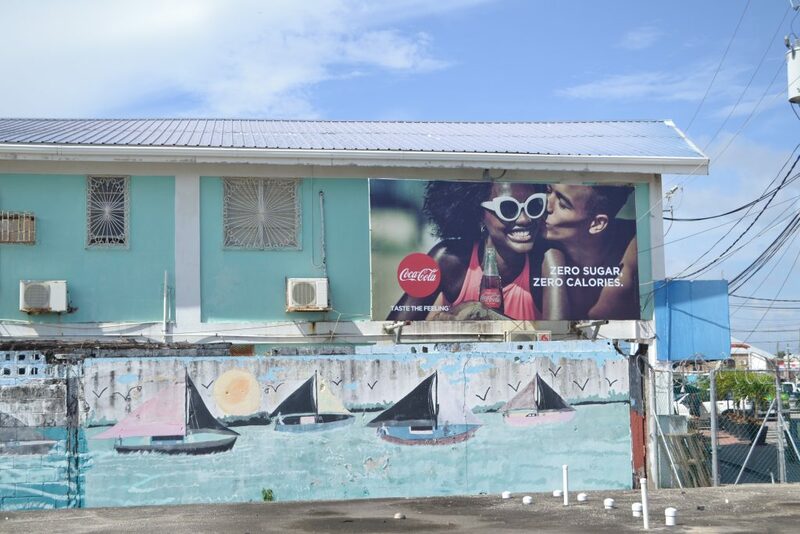 There are many upgrades taking place within the City as businesses grow and the government continues to build and improve the infrastructure. 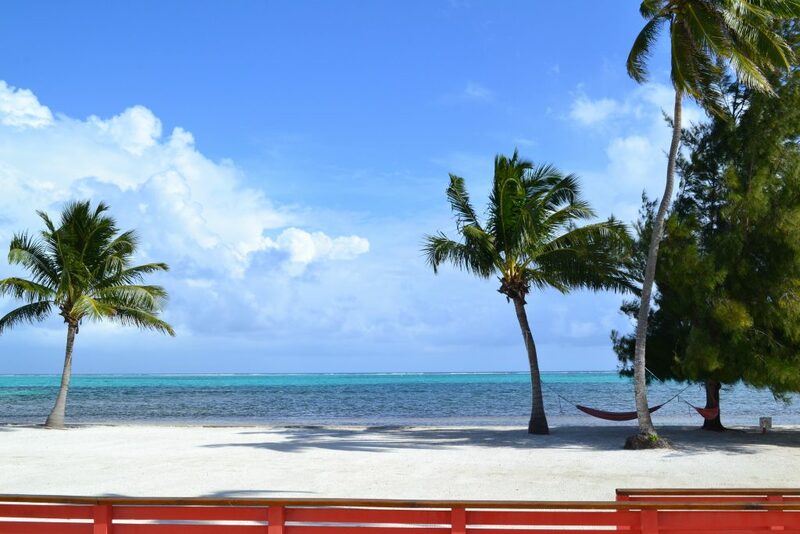 While I enjoyed the drive through town, I am happy we decided to stay in San Pedro on Ambergris Caye rather than Belize City. The laid-back vacation style, island architecture, and colors without the busy-ness of traffic was right up our alley. 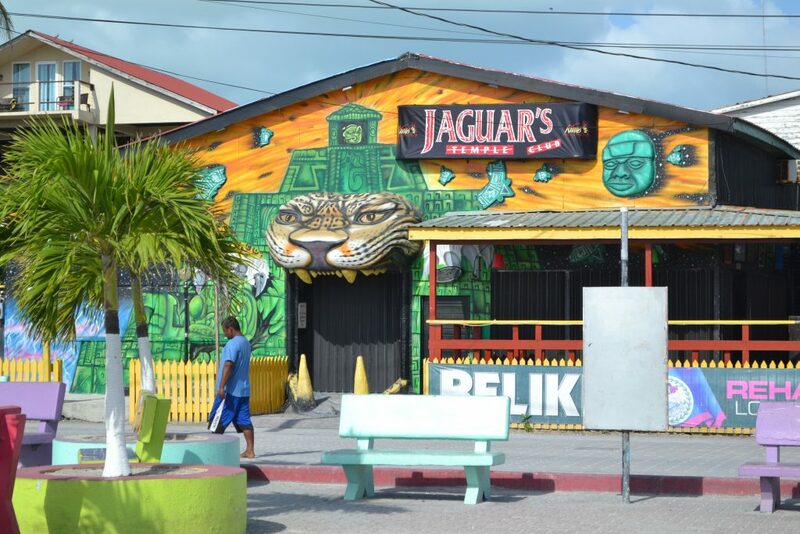 We didn’t stop for a picture, but if you are interested in taking a picture with the infamous ‘BELIZE’ monument, it is located just a few minutes from the water taxi and overlooks the ocean. If you stop and ask someone for directions, they will know what you are referring to and can direct you. After we checked in our bags with the water taxi workers, we made our way down the dock to grab some snacks for the 1.5-hour ride. 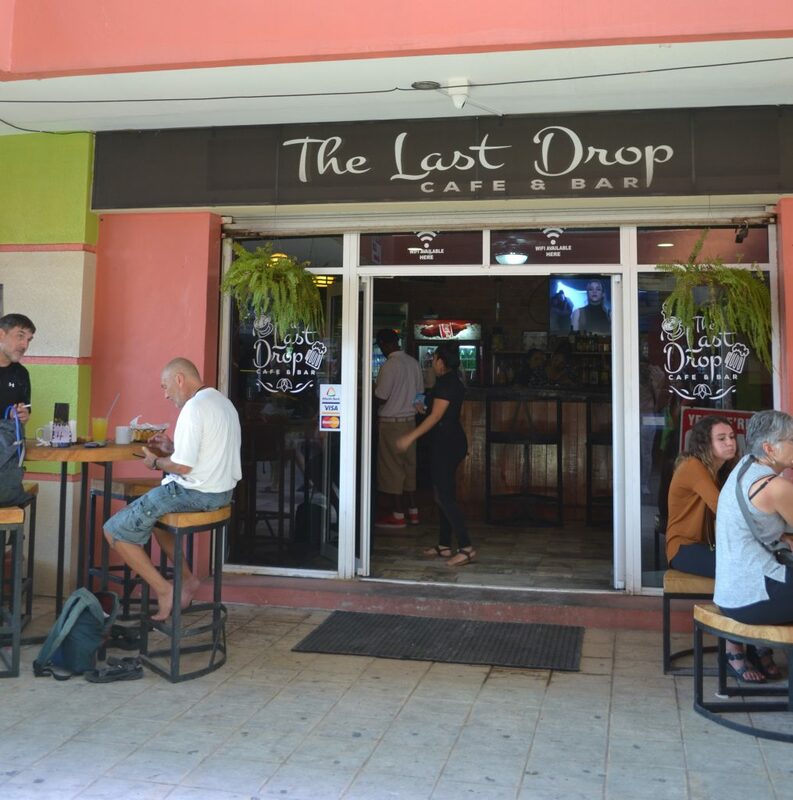 We stumbled upon a cute cafe called The Last Drop Cafe & Bar that offers breakfast, sandwiches, traditional Belize beans, and rice as well as sweets and coffee. 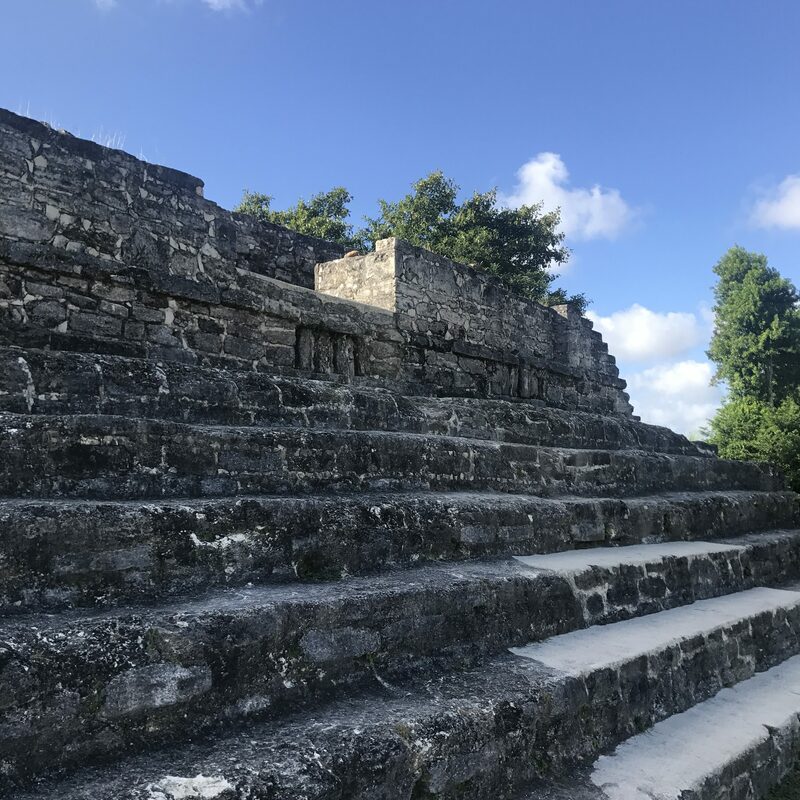 While most places do take credit cards, we noticed there is typically a minimum so your best bet is to use Belize dollars. The shops and restaurants that are cash only will have signs noting this, but it’s always helpful to ask before ordering. Belize to USD exchange is 2:1 which makes things super easy to calculate. You’ll just need to divide the Belizean dollar amount in half to get your USD and they conveniently charge everything in their currency. If you aren’t aware, you should ALWAYS charge your credit card to the country’s currency to avoid paying additional exchange fees. The water taxi was right on time and once we got to Ambergris Caye, we were welcomed by a hotel greeter that was so kind! He grabbed our bags and took us to a local supermarket to get a few snacks and of course, Belikin beer. 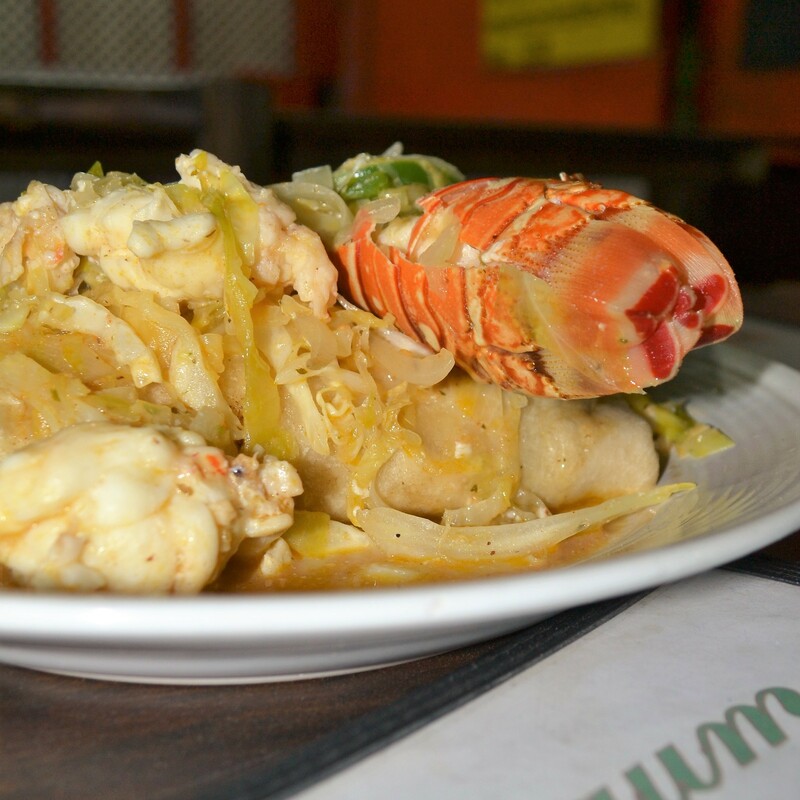 This is one of my island favorites! We had it in St. Lucia and I really enjoyed it. It was late by the time we got to Costa Blu so we had dinner at their hotel restaurant. I had the Caribbean Jerk Shrimp with rice and beans and my husband had a Cajun Alfredo pasta. We sat on the beach and enjoyed the sounds of the ocean for a bit and then headed back to the room for a couple of beers and get to bed. My day started so early. 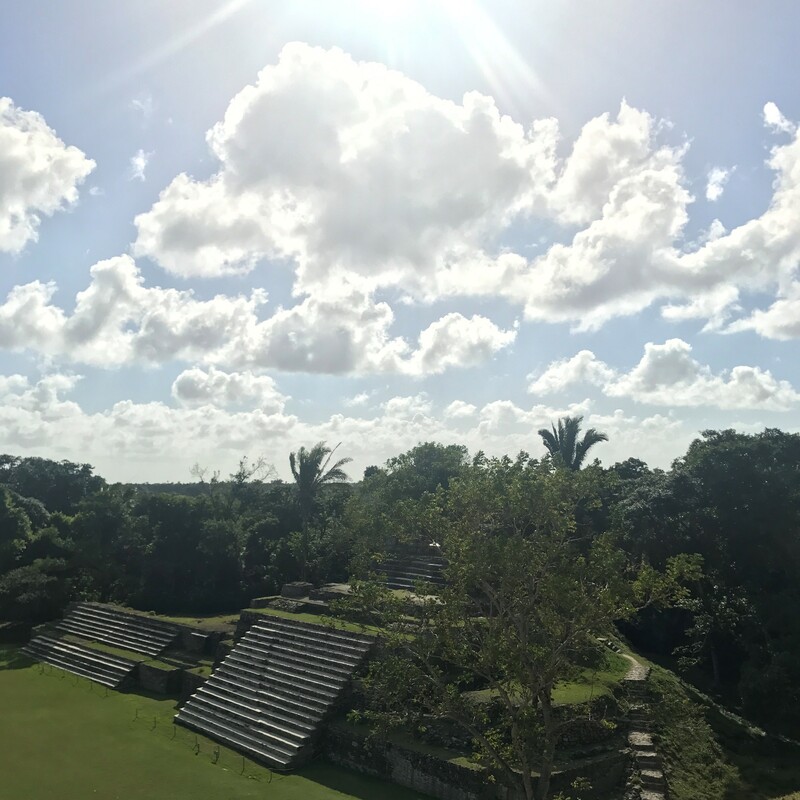 I was so excited to be in Belize, I woke up around 6:45 am, made coffee and sat on the balcony to take in the beautiful views! We then made our way to the hammocks to relax and then to the beach chairs to take in some natural Vitamin D. It was a wonderful way to start the day. I wish I woke up with this much excitement for the day when I have to wake up early for work. I barely have time to even heat up a microwave breakfast sandwich because I wait until the last minute to get ready. Maybe one day. ha! 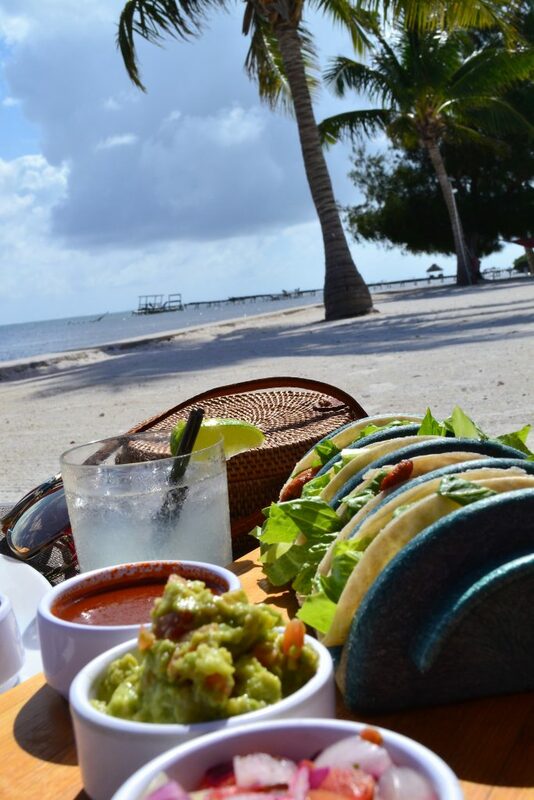 We ordered lunch on the beach: I had chicken tacos and my husband ordered the chicken quesadillas – amazing! The presentation of the food was totally Instagram worthy and both our meals were delicious. It was only right we washed them down with more Belikin and margaritas. When we were planning our trip, we decided to not book any excursions because the weather was expected to have heavy rains all week. If you’ve ever been to the tropics, you know that it can rain at any time or even rain really hard for 10 minutes and then clear up as if there wasn’t a single rainfall. Luckily, our day ended up being beautiful and sunny so we booked an afternoon excursion with Tuff Enuff Tours through our hotel. We were picked up by a boat right by the hotel dock around 1:45 pm that afternoon and then sailed about 30 minutes to Mexican Rocks to snorkel. Oh. My. Goodness. We’ve snorkeled in 5 different countries but this was by far the best experience we’ve ever had! Most people go to Hol Chan which I heard was amazing but since Mexican Rocks is closer to the reef, we were told we would see more colorful fish and better coral formations and it certainly did not disappoint. It did get cloudy and then start raining suddenly as we were out on the boat so we thought our snorkel experience was going to be terrible but it did not affect the experience. 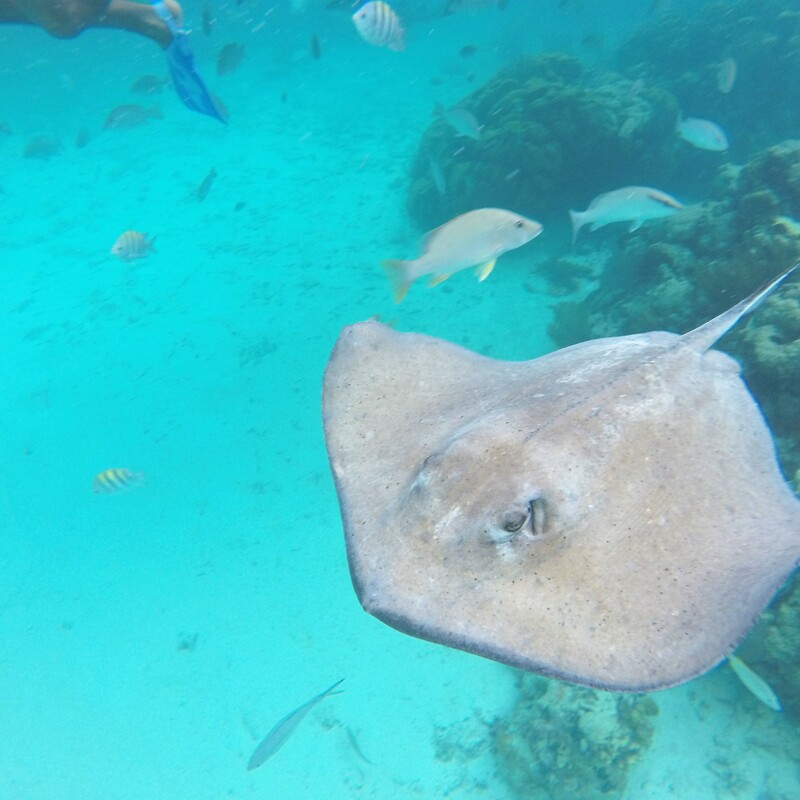 Because we were so close to the Barrier Reef – the second largest in the world after Australia – we saw a huge variety of fish. There were so many colors, so many different species, and so many sizes; it was truly magical. We even watched an eel eat a fish whole and digest it. It was very weird but very cool. 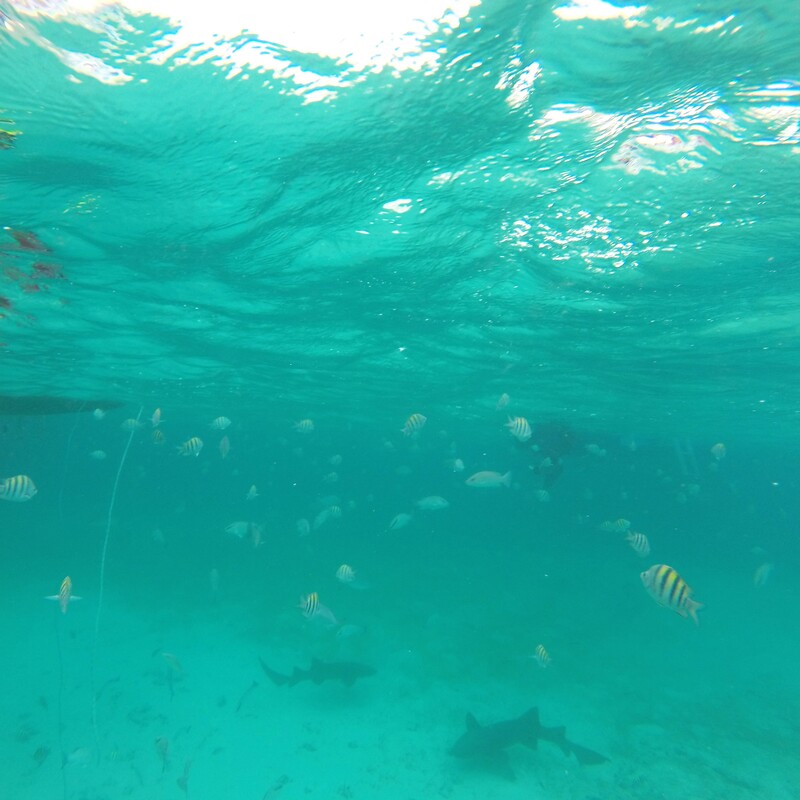 We touched stingrays and nurse sharks and I found myself surrounded by a large school of fish at one point. I am so happy to have had my Go-Pro with me (and charged) so I can capture this memory. If you don’t have a Go-Pro, no worries! Check out this waterproof case (for iPhones). 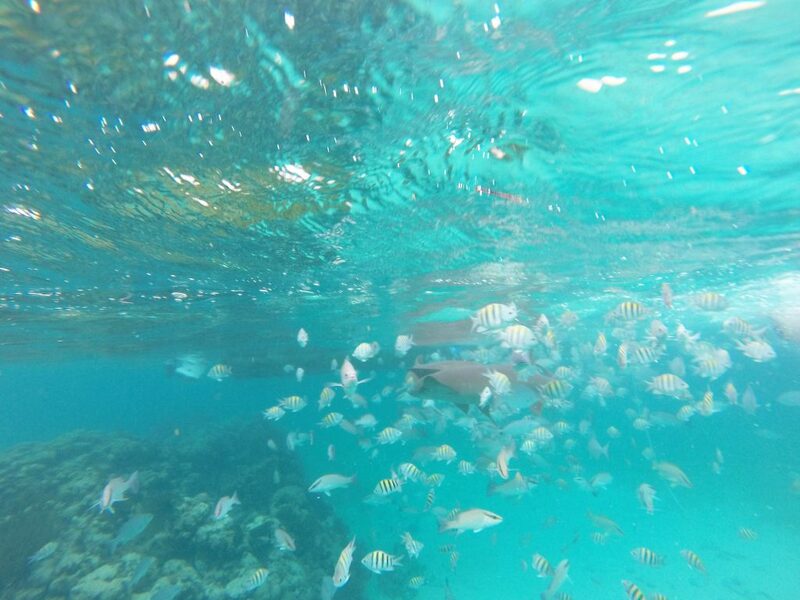 Here is another more affordable option that I have also used to record snorkeling experiences. 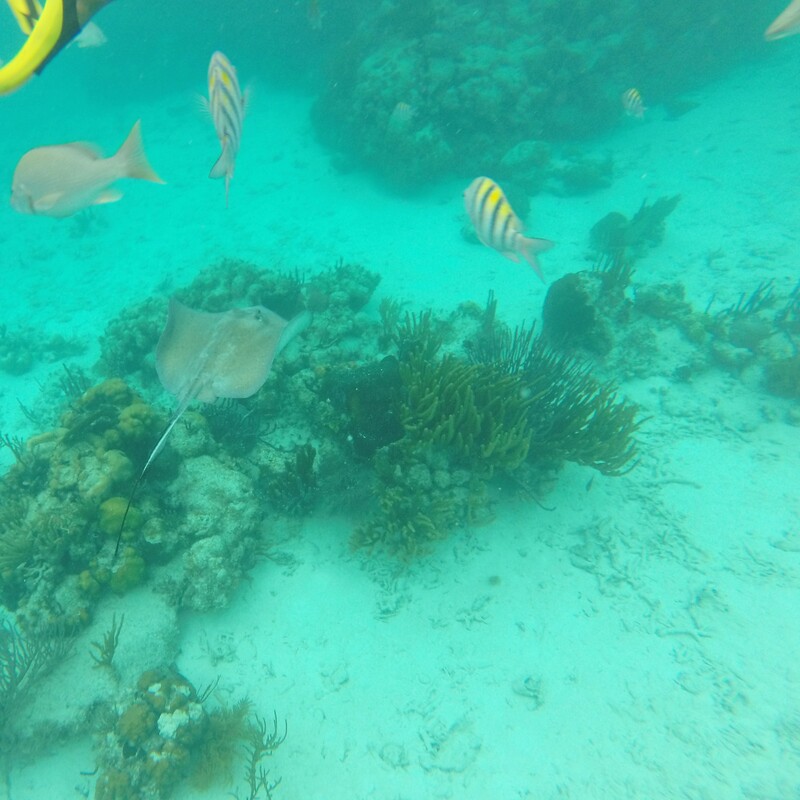 Snorkeling in Hol Chan and Mexican Rocks requires less travel time from Caye Caulker or Ambergris Caye which is certainly a plus. While the trip to the Great Blue Hole is not bad, we decided to not book that excursion because it’s more of a diver’s paradise (over 30 feet) rather than a snorkeling location. It is also an all-day excursion and much more expensive than other options. After our excursion, we relaxed for a bit and then got dressed to go into town for a late dinner. We didn’t realize the restaurants close around 9:00pm (which means kitchens close around 8:30pm) and we go into San Pedro around 8:45pm so we spent a good amount of time searching for a late night spot. That’s when we came across Albertina’s Fast Food Cart. 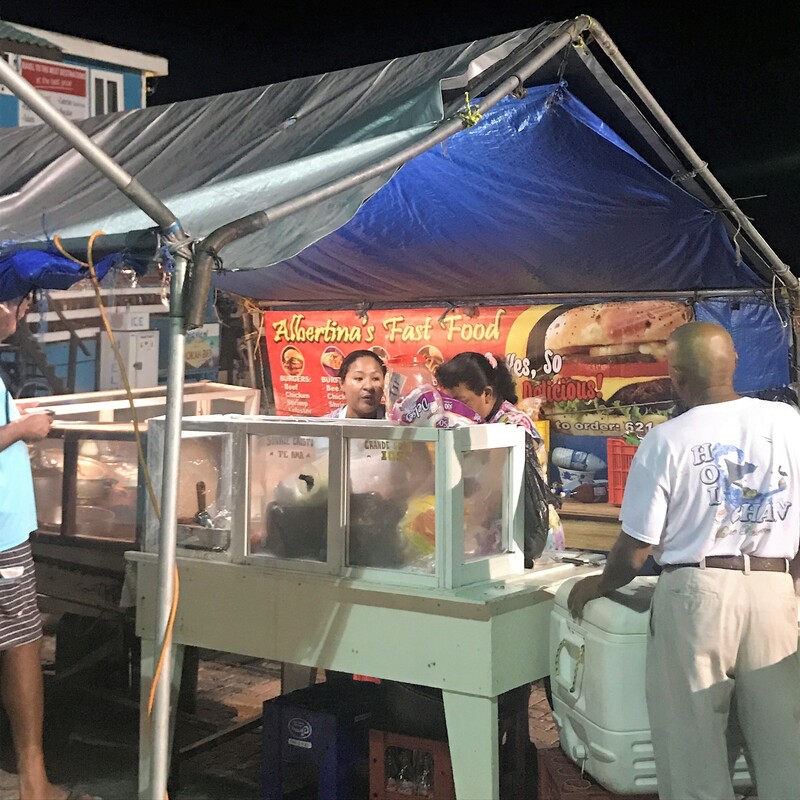 They operate in the same location each day and night, right by the dock into Ambergris Caye and they only take cash. They offer quesadillas, burritos, burgers and more – very good and extremely cheap. We spent a little time at Jaguar Nightclub and called it a night shortly after. The nightlife in Belize starts pretty late and we were too tired to stay out but they were definitely having a GOOD time inside. Our last full day on the island was filled with so much adventure. After starting our morning relaxing beachside on the hammocks again, we decided to go on a full day escapade. We were told about Secret Beach so we were on a mission to make this our first stop! Secret Beach was about a 15-minute ride on the golf cart and it was bumpy the entire way. Right at the bend of the path, there was a sign to veer to get to Secret Beach and we passed drivers they gave us the thumbs up that the bumpy ride was worth it. 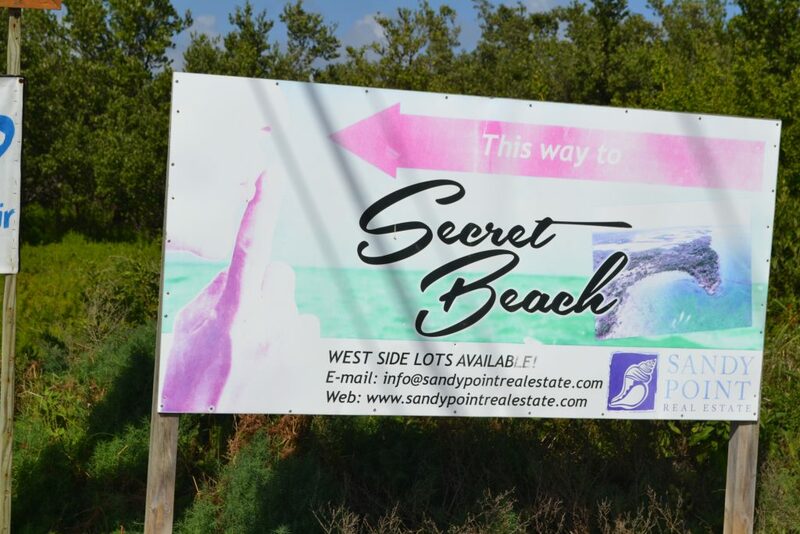 Once we got to Secret beach, we were greeted by the ocean and a sign that read ‘Everyone’s Welcome.’ So we went down that side-street and it lead us to Wayne’s World Bar and Grill. I ordered a shrimp meal but I don’t remember what it was called on the menu but I’ve included an image below. My husband ordered fresh snapper which was caught earlier that morning. Both meals were so good; so glad we came across this spot. 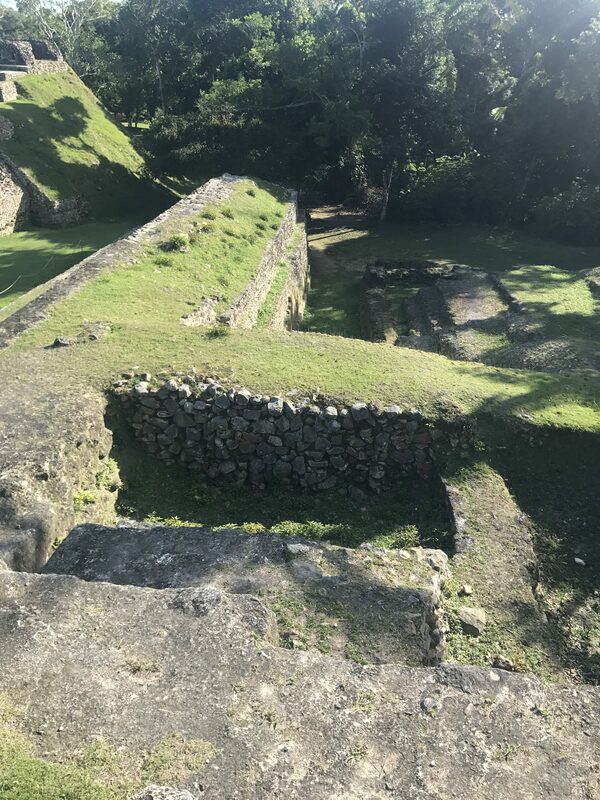 Just like every other place in Belize, our view was amazing and we met some great people while enjoying our delicious meal. After our tummies were full, we decided to hang out a bit by the water and just relax. We watched people jet skiing and using electronic wakeboards. Not sure where they rented these but they looked like fun! 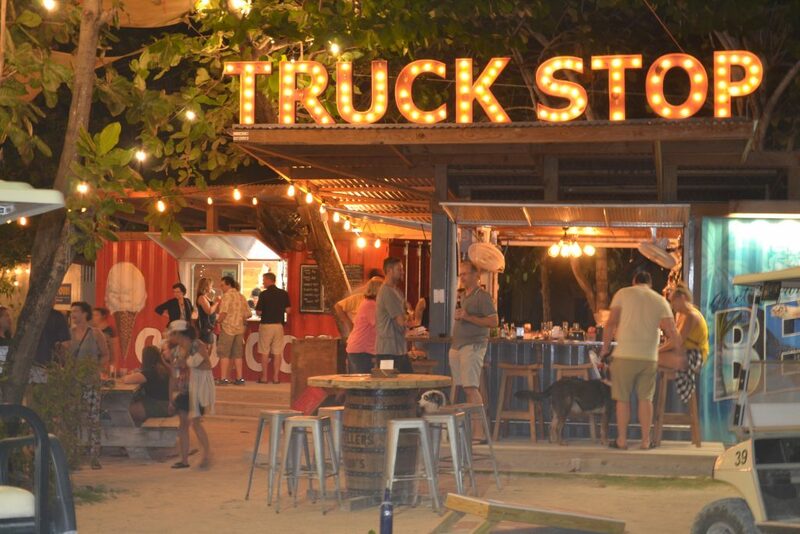 We then made our way to the Truck Stop which is a shipping container food park just outside of San Pedro. This is basically an all-in-one one-stop shop that is a definitely a must-do on your trip. There are 2 bars, 2 restaurants, an ice cream shop, a game area with corn hole and oversized checkers, a pool and a deck that extends over a river that is filled with alligators! You are not allowed to get into this water, of course. 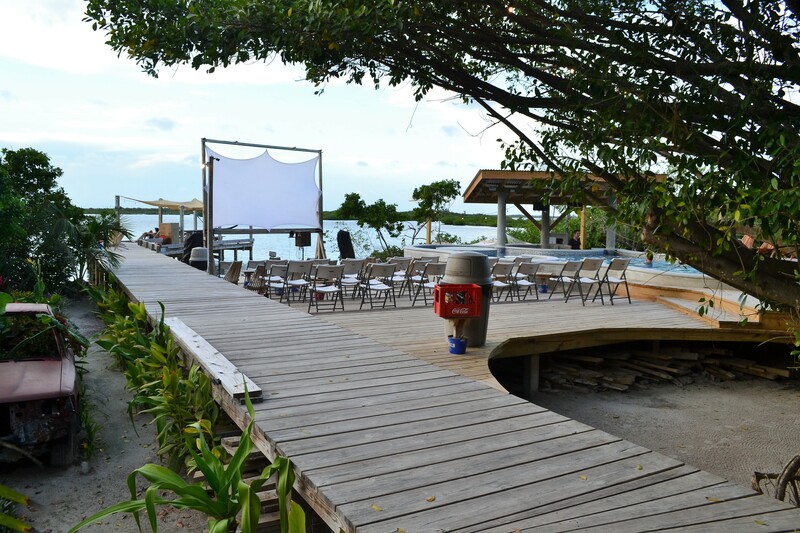 They also host movie nights on their outdoor makeshift movie theater and corn hole competitions. We saw a lot of familiar faces while there and had a great time. The crowd just kept on getting bigger with people who come by each night and travelers who were just passing through and got sucked in. When planning this trip, I kept seeing the same restaurant with the giant lobster burrito brought up so we made it a mission to check this place out for dinner and it certainly did not disappoint. 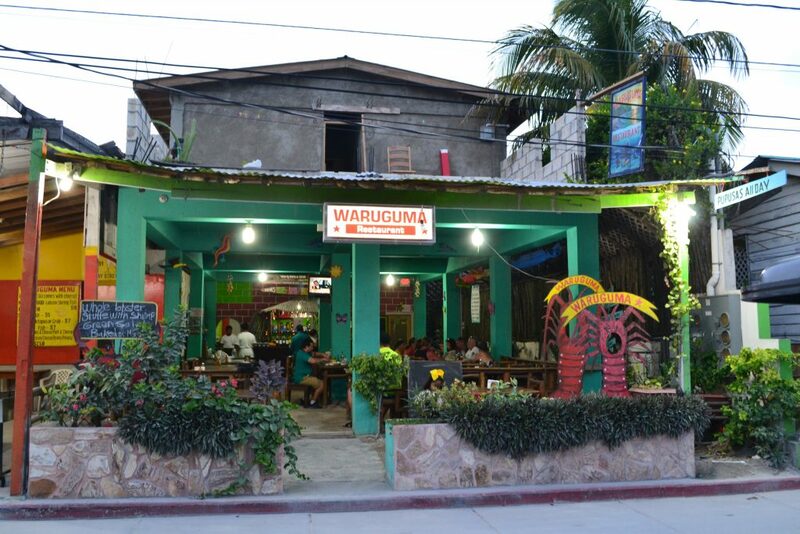 Waraguma is located on Back Street of San Pedro. Basically, the downtown area has 3 main roads that people refer to as Front Street, Middle Street and Back Street. This one burrito fed my husband and I and we had leftovers. And we came hungry knowing that the burrito was pretty big but wow were surprised at how full it was. Super tasty and definitely a spot I recommend as a must eat spot. Our last morning had another early start to it so we could enjoy the beach a bit before heading back to the Mainland to catch our afternoon flight. 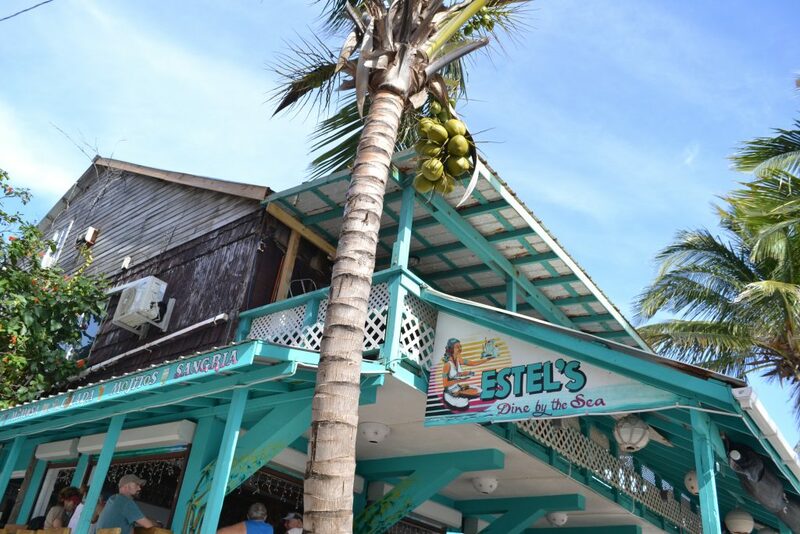 We got to San Pedro pretty early so we could enjoy breakfast at Estel’s which was so delicious. They open at 6am serving a very robust food and drink menu. It’s conveniently located right by the Water Taxi dock so we were able to watch our boat arrive as well. 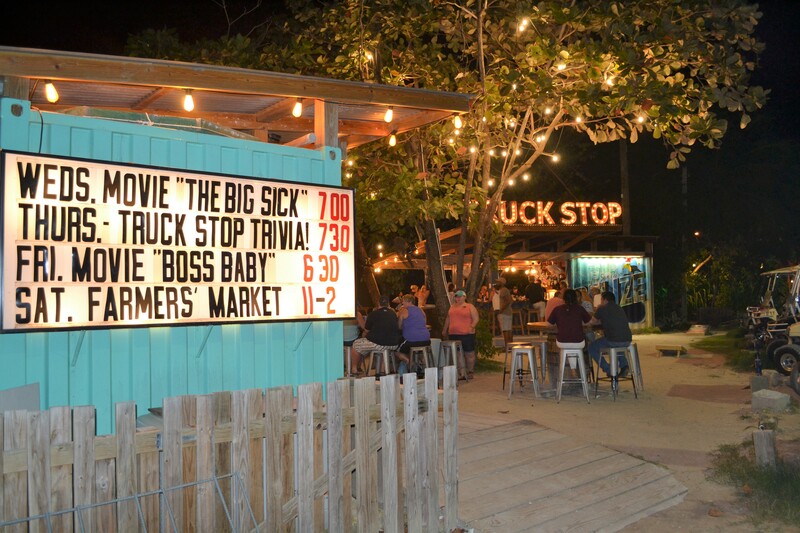 This is a super wild ‘event’ the locals’ host every Thursday at Wahoos Lounge on Ambergris Cay. They have a big party on the beach right outside of the bar where a local band will play and they basically set up a large bingo board on the beach. Viewers can purchase tickets as to which square they think the chicken is going to poop (let’s be mature, guys) when it is placed on the board. Apparently, the crowd gets really excited and everyone’s cheering the chicken to move or stay and if you guessed the correct space there is a money prize! We didn’t get to go due to our trip dates but if we were there we would have definitely made it a point to attend. Check out their Facebook Page for more details. 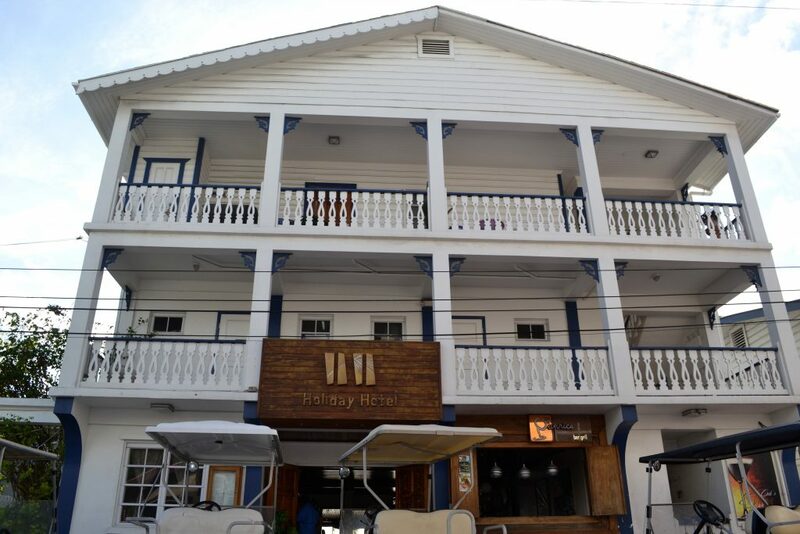 Holiday Hotel carries the fame of being the first hotel opened to the public in 1965. 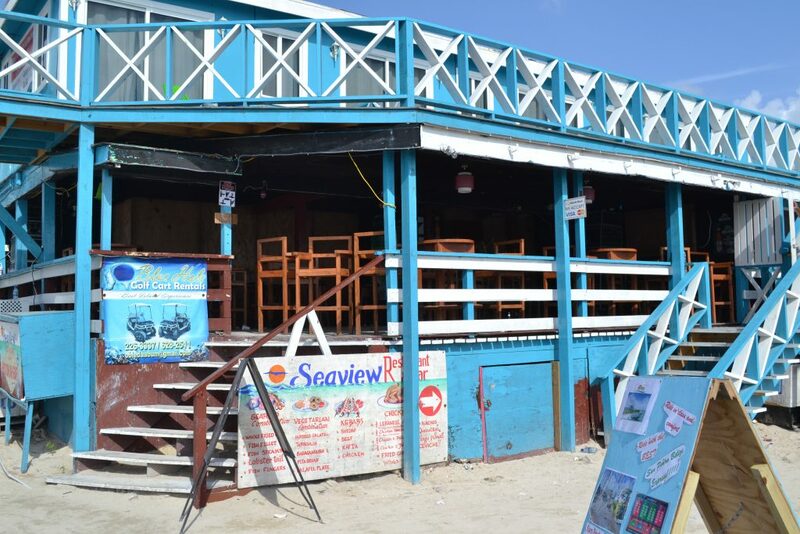 They also have a couple of casual restaurants that have views of the beach. Loud music and sounds of laughter drew us to this spot one night. We didn’t stay because the kitchen was closed but it looked like a good time. 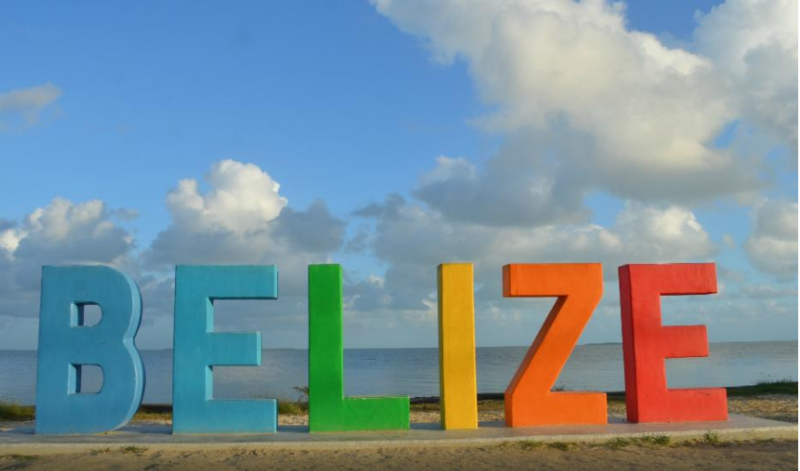 Wow…Belize sounds like an awesome place. There are so many things there I would enjoy if I decide to visit. I love adventures so I would definitely like to do an excursion with Tuff Enuff Tours. 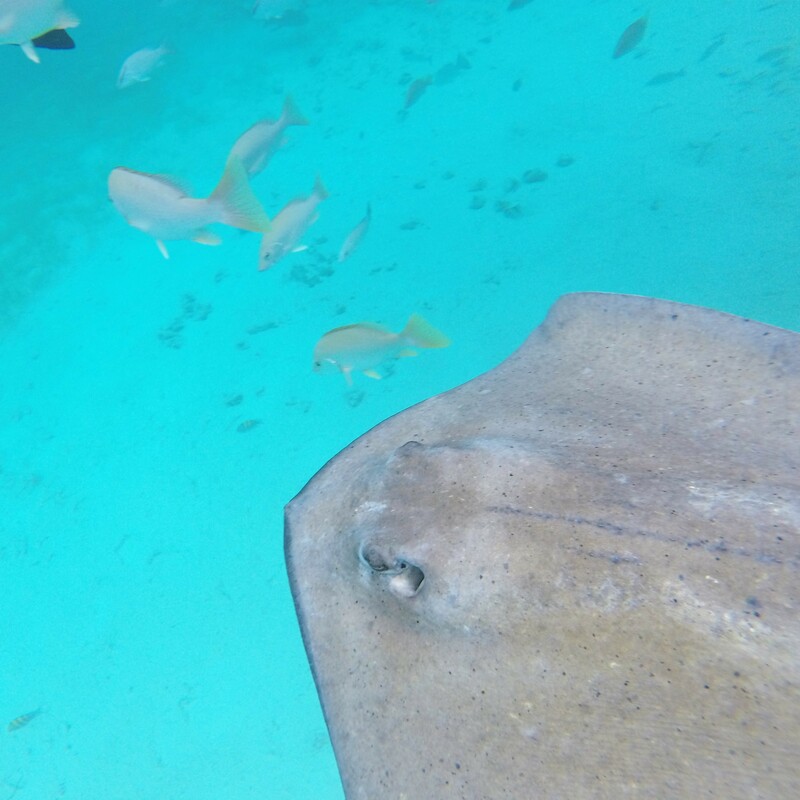 Swimming with stingrays and nurse sharks sounds like so much fun. 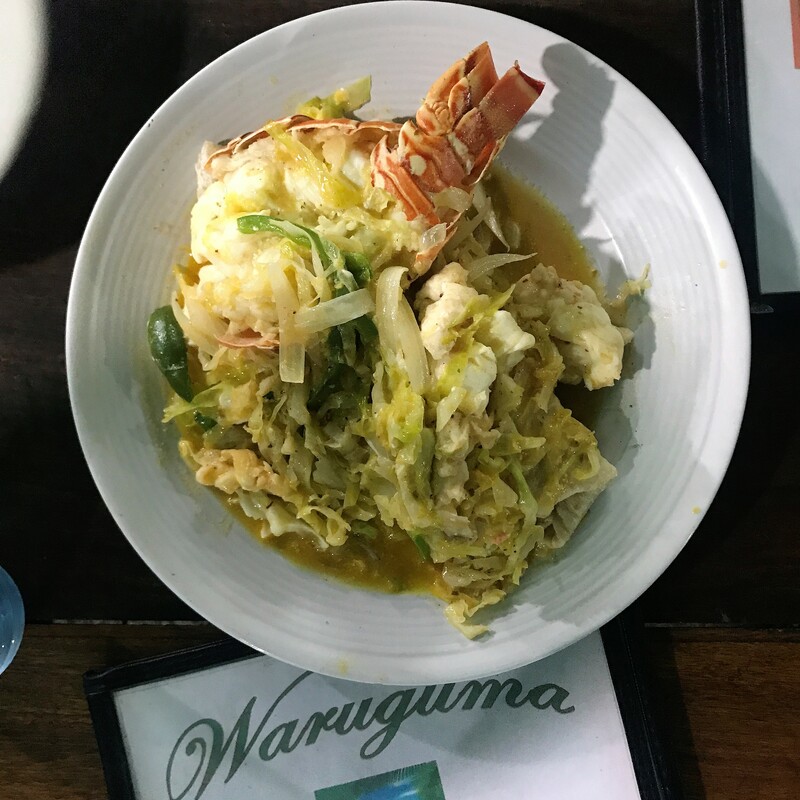 Another place I would like is Waruguma. I LOVE seafood, so a lobster burrito sounds delicious. Thanks for sharing your experiences and giving so much helpful information. Tuff Enuff tour guides were so great! 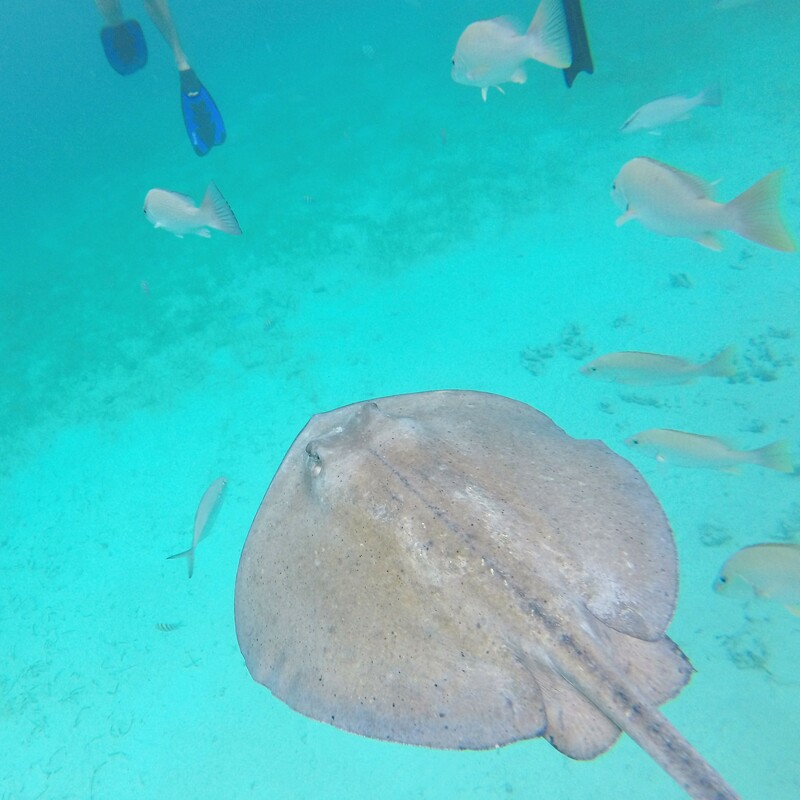 They really made our snorkeling experience better than I could have imaged and would recommend them any day! 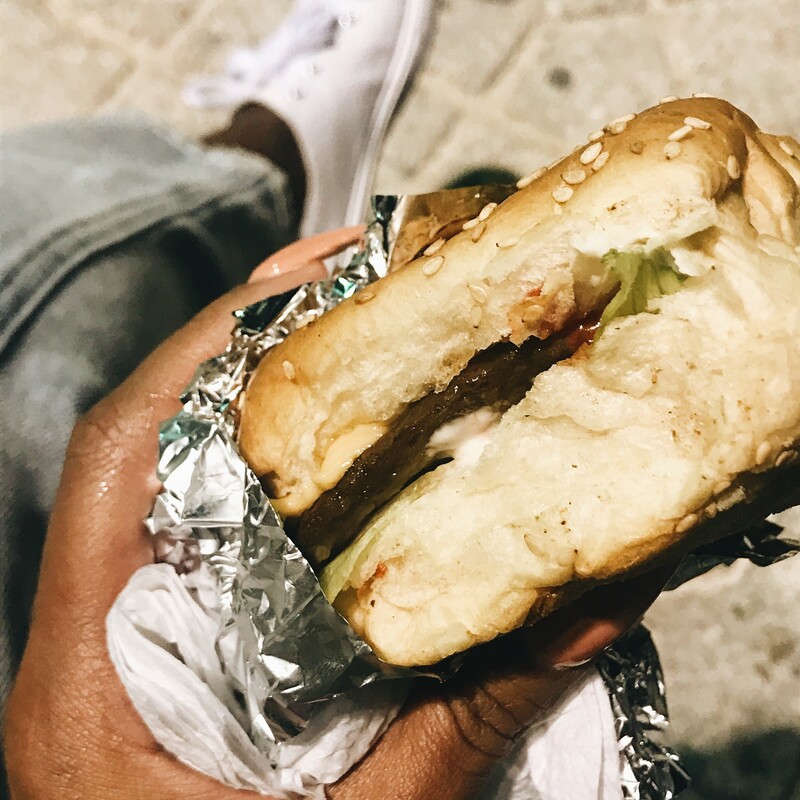 Doesn’t matter where you go, nothing like late night STREET MEAT! Good to know Belize is apart of the universal need to have night time eats. I’m right with you on that, Jessica- I love street meat! Omg. This trip looks amazing. 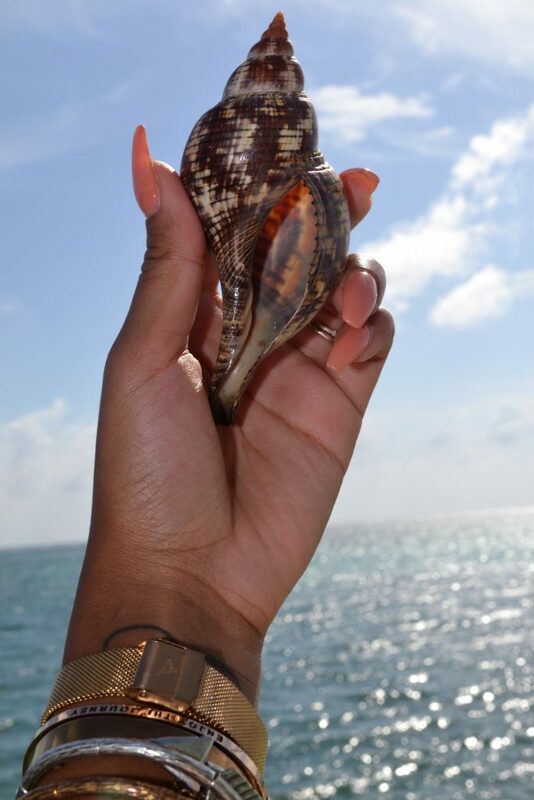 I’m all about amazing views, ocean and good eats. Costa blu’e on-site restaurant with the jerk shrimp and rice could have me booking a flight right now. Or WARAGUMA delightful seafood! I can’t decide! Thanks for sharing. Wow! 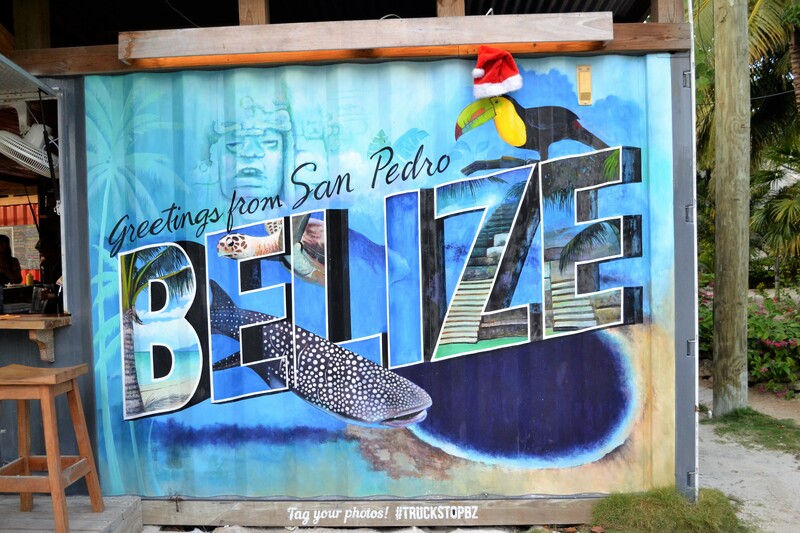 Belize looks like a beautiful and colorful place to visit! So many vibrant colors at every turn, how can you not feel at peace. If I were to visit I would definitely love to try some of the awesome food you have pictured (yum!). I would for sure try out Waragum b/c who doesn’t like a giant lobster burrito?? And I would also head to Wayne’s World Bar & Grill! As you can see, food is a top priority for me when traveling! 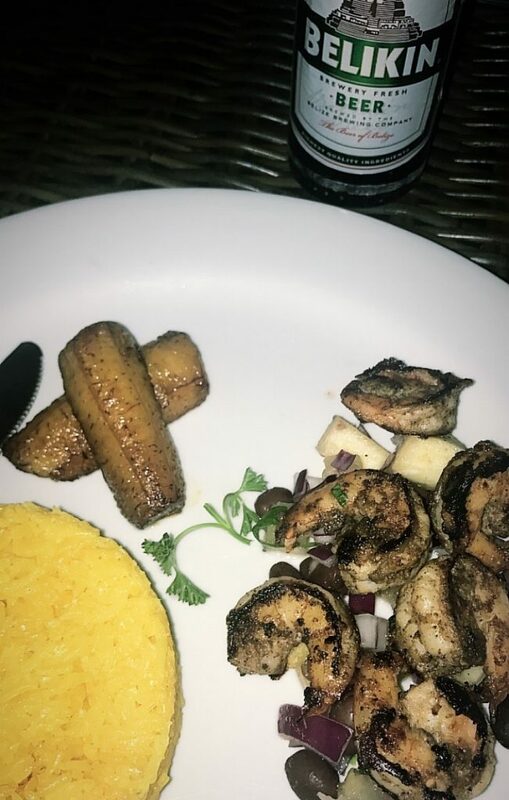 Thank you for sharing your beautiful experience, and of course, the food lol! 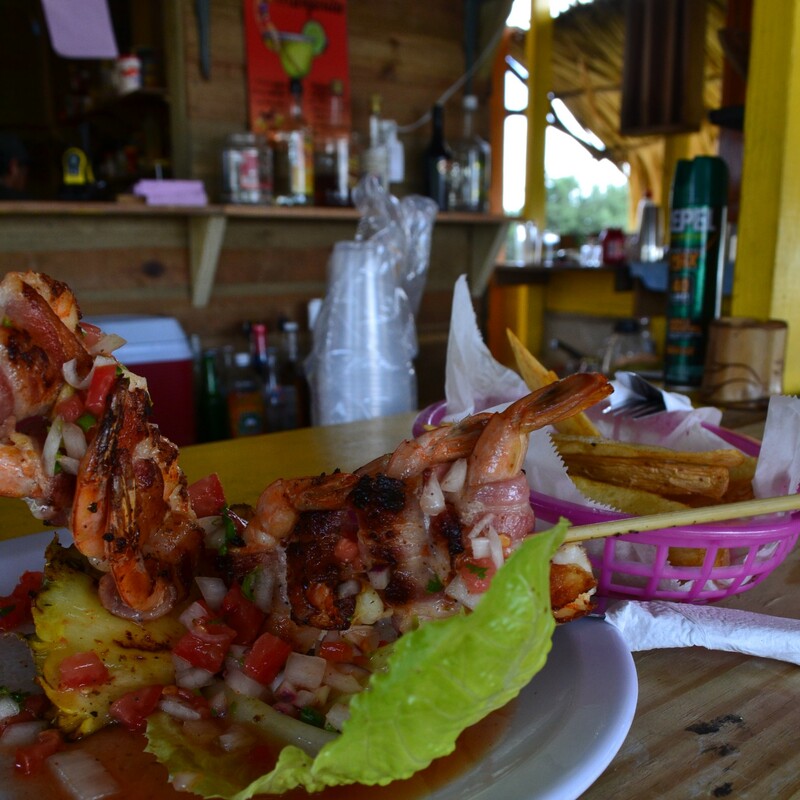 Belize would be just the place to feed your food needs! 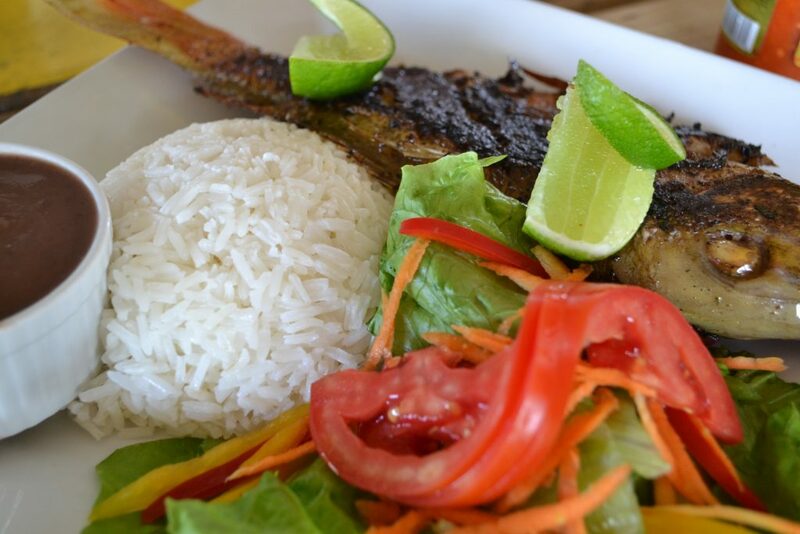 While their main cuisine is rice and beans, their seafood is amazing and fresh!